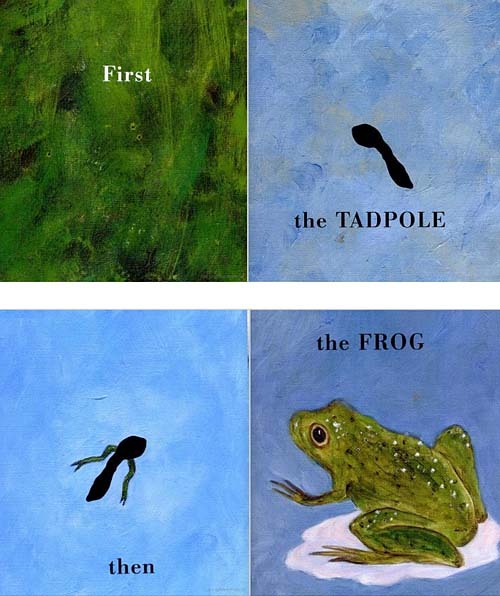 First the Egg this simple picture book for young children, die-cuts, minimal text, and brightly colored illustrations show a series transformations that take place in nature (ie: a tadpole becomes a frog) and due to the efforts of human creativity (ie: paint becomes a picture). 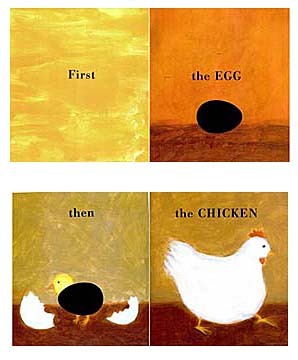 Seeger's books often take a common children's book premise (ie: opposites in Black? White! Day? Night!...) and present it in such a wholly unique way that you are compelled to flip through the book again and again. This book is no different. You've surely seen books about transformations in nature before (ie: tadpole to frog), so what could be so special about this one? The answer is in the execution. 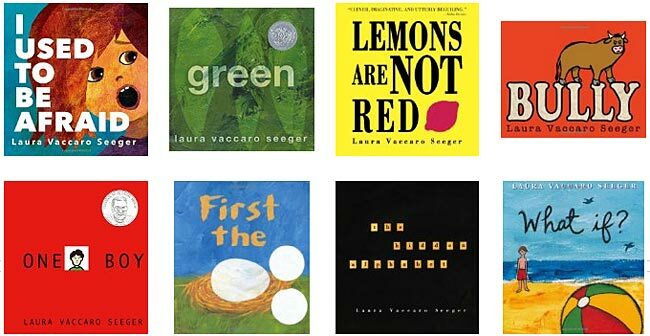 Seeger's illustrations are minimal but exuberant, with bright swaths of color and thickly textured backgrounds. Everything about the presentation is subtle but perfectly executed. In fact, Kirkus Reviews called this book was "another perfectly pitched triumph from an emerging master of the concept book." So true! Below and at right are two sample pages from inside the book. As you can see, this isn't a picture book with a lot of text, but the execution is exceptional! 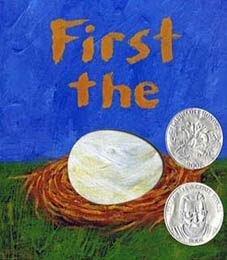 The book includes several examples of transformation, each in the same format: "First the _____ / then the ____." In each instance, the simple dye-cut is worked into the transformation.